Buy Warm Buddy Teddy Bears, heat up in microwave. WARM-BUDDY - Teddy Bear, heat up in the microwave! 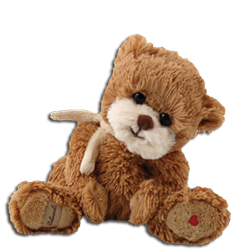 These microwavable Teddy Bears come with a removable heat pack that contains all natural ingredients. A Warm Buddy's soothing warm/cold inner pack can be heated in the microwave or cooled in the freezer as desired. Our Warm Buddy animals promote relaxation and provide natural relief from aches, pains and stress.